You wouldn’t think your insurance company would invest your premiums in businesses that increase the catastrophes you’re paying them to protect you against. A recent study published in the scientific journal Climatic Change showed that emissions from products and processes of 90 fossil fuel companies – the very companies insurers invest in – caused about 50% of the rise in global temperatures. That warming powered wildfires, hurricanes, and other climate-related catastrophes – the very things insurers (like us) insure against. Last year saw a new record for devastation by hurricanes and wildfires – and there’s no reason to think 2017 will hold the record for long: 17 of the 18 hottest years ever were since 2001 (climate.gov, NASA and NOAA). And it’s not just property that’s being destroyed. Those greenhouse gasses poison our air too, bringing premature death to millions, and visiting pain and suffering on millions more (The Lancet). In as much as such tragedies can be paid for with money, it is often health and life insurance companies that do the paying. You’d have thought that self interest, if not the greater good, would dissuade insurers from backing the worst offenders. That’s been true of some of our European counterparts, yet in the US insurance companies are “the country’s second largest institutional investor in oil, gas and coal with $459 billion in fossil fuel investments.” (The Guardian). 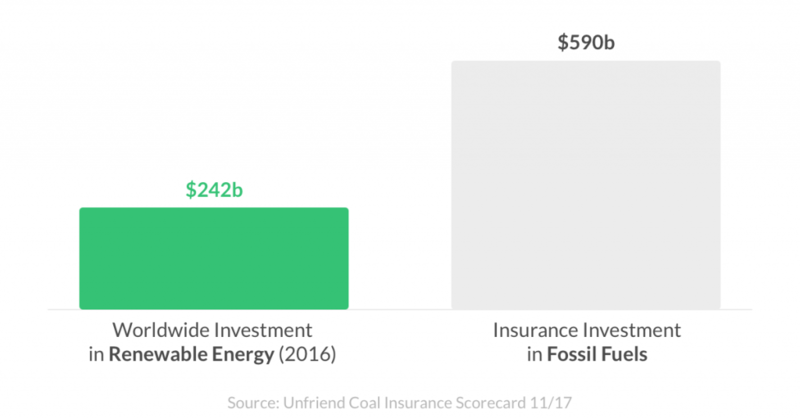 Not a single US insurance company has publicly forsworn investment in fossil fuels generally, or coal specifically. But we’re a young company, and our funds are a drop in the ocean. Which is why we’re calling on our industry – our reinsurance partners, our competitors, and our colleagues in health and life insurance companies – to join us by divesting from coal and other major polluters. And for those in our industry who underwrite polluting projects – like coal power plants or tar sands mining – we have a simple ask: please don’t. Lemonade is a Public Benefit Corporation, meaning we legally may (indeed must) consider the greater good of our decisions, even at the expense of near-term profits. We recognize other insurance companies operate in a more traditional legal framework, with a narrow mandate to maximize profits. But here’s the thing: the interests of our investors and our environment are not at loggerheads. It’s a false dichotomy. Doing the right thing benefits our customers and our shareholders and our future. Postscript: ‘Why Lemonade Won’t Invest In Coal‘ was originally published on the Lemonade website, 11 September. This is post #2 in its ‘Ethics of Insurance’ series. Post #1, on the stand Lemonade took on guns, can be found here.